Authors: Bozhko Y.G., Arkhipov M.V., Belokonova N.A., Kiseleva D.V. Aim. To determine magnesium deficiency in patients with paroxysmal atrial fibrillation using a comprehensive clinical and laboratory approach. Methods. The prospective cohort study included 35 patients of the cardiology department of the Medical association «Novaya bolnitsa». The main group consisted of 22 patients with frequently recurrent paroxysmal atrial fibrillation, the control group - 13 patients without cardiac arrhythmias. The clinical status, Holter-monitoring of the electrocardiogram, the results of the clinical test for magnesium deficiency, laboratory parameters of calcium, magnesium in blood plasma and formed elements, magnesium in whole blood, free fatty acids and plasma osmolarity were evaluated. Results. The clinical score of magnesium deficiency was significantly higher in patients from the main group compared to the control [16.5 (11÷21) vs 13 (8÷15), p <0.001]. In the main group, there was a decrease of magnesium in the whole blood [0.55 (0.5÷0.59) vs 0.61 (0.58÷0.54), p=0.002] and inside the blood cells [0.68 (0.53÷1.29) vs 1.38 (1.29÷1.44), p <0.001]. In patients with atrial fibrillation there is a shift of the ratio of calcium to magnesium in blood plasma [2.5 (2.5÷3) vs 2.9 (2.8÷3.15), p=0.029] and intracellularly [4.85 (2.62÷9.3) vs 1.7 (1.4÷1.95), p=0.002]. The redistribution of calcium and magnesium is influenced not only by the initial concentration of cations, but also by free fatty acids. The best redistribution was obtained when the concentration of free fatty acids was 900 µmol/l, magnesium 1 mmol/l, and calcium 3 mmol/l, which is consistent with the optimal value of cations in the blood plasma. Conclusion. Patients with paroxysmal atrial fibrillation had a significantly lower magnesium content in whole blood and inside the blood cells; magnesium concentration in the cells and in whole blood closely correlated with the results of the clinical test for evaluating magnesium deficiency; intracellular magnesium content can be influenced by the complexing interaction with free fatty acids. paroxysmal atrial fibrillation, magnesium deficiency, intracellular magnesium, free fatty acids, calcium-magnesium index. Kolte D., Vijayaraghavan K., Khera S. et al. Role of magnesium in cardiovascular diseases. Cardiol. Rev. 2014; 22 (4): 182–192. doi: 10.1097/CRD.0000000000000003. Abbott R.D., Ando F., Masaki K.H. et al. Dietary magnesium intake and the future risk of coronary heart di­sease (the Honolulu Heart Program). Am. J. Cardiol. 2003; 92 (6): 665–669. doi: 10.1016/S0002-9149(03)00819-1. Ichihara A., Suzuki H., Saruta T. Effects of magnesium on the reninangiotensin-aldosterone system in human subjects. J. Lab. Clin. Med. 1993; 122 (4): 432–440. PMID: 8228558. King J.L., Miller R.J., Blue J.P.Jr. et al. Inadequate dietary magnesium intake increases atherosclerotic plaque development in rabbits. Nutr. Res. 2009; 29 (5): 343–349. doi: 10.1016/j.nutres.2009.05.001. DiCarlo L.A.Jr., Morady F., de Buitleir M. et al. Effects of magnesium sulfate on cardiac conduction and refractoriness in humans. J. Am. Coll. Cardiol. 1986; 7 (6): 1356–1362. doi: 10.1016/S0735-1097(86)80157-7. Khan A.M., Lubitz S.A., Sullivan L.M. et al. Low serum magnesium and the development of atrial fibrillation in the community: the Framingham Heart Study. Circulation. 2013; 127 (1): 33–38. doi: 10.1161/CIRCULATIONAHA.111.082511. Misialek J.R., Lopez F.L., Lutsey P.L. et al. Serum and dietary magnesium and incidence of atrial fibrillation in whites and in African Americans — Atherosclerosis Risk in Communities (ARIC) study. Circ. J. 2013; 77 (2): 323–329. doi: 10.1253/circj.CJ-12-0886. Krijthe B.P., Kunst A., Benjamin E.J. et al. Projections on the number of individuals with atrial fibrillation in the European Union, from 2000 to 2060. Eur. Heart J. 2013; 34: 2746–2751. doi: 10.1093/eurheartj/eht280. Brüggenjürgen B., Rossnagel K., Roll S. et al. The impact of atrial fibrillation on the cost of stroke: the berlin acute stroke study. Value Health. 2007; 10 (2): 137–143. doi: 10.1111/j.1524-4733.2006.00160.x. Sheikh A., Patel N.J., Nalluri N. et al. Trends in hospitalization for atrial fibrillation: epidemiology, cost, and implications for the future. Prog. Cardiovasc. Dis. 2015; 58 (2): 105–116. doi: 10.1016/j.pcad.2015.07.002. Andrade J., Khairy P., Dobrev D. et al. The clinical profile and pathophysiology of atrial fibrillation: relationships among clinical features, epidemiology, and mechanisms. Circ. Res. 2014; 114: 1453–1468. doi: 10.1161/CIRCRESAHA.114.303211. 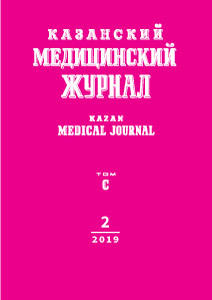 Mubagwa K., Gwanyanya A., Zakharov S., Macianskiene R. Regulation of cation channels in cardiac and smooth muscle cells by intracellular magnesium. Arch. Biochem. Biophys. 2007; 458: 73–89. doi: 10.1016/j.abb.2006.10.014. Reinhart R.A., Marx J.J., Broste S.K., Haas R.G. Myocardial magnesium: relation to laboratory and cli­nical variables in patients undergoign cardiac surgery. J. Am. Coll. Cardiol. 1991; 17: 651–670. doi: 10.1016/S0735-1097(10)80179-2.
analysis. Ann. Thorac. Surg. 2005; 80: 2402–2406. doi: 10.1016/j.athoracsur.2005.03.036. © 2019 Bozhko Y.G., Arkhipov M.V., Belokonova N.A., Kiseleva D.V.